The microsatellite search by profiles for identification purposes is based on the nine SSR-markers displayed below. Applied and approved within two European projects Genres081 and GrapeGen06 , they are considered as a minimal standard marker set. The allele sizes of the SSR-markers were taken from bibliographical sources, SSR-marker databases freely available on the web and from mainly unpublished data generated by the Institute for Grapevine Breeding Geilweilerhof and funded by the BÖLN-project. 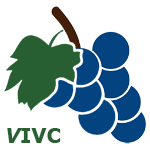 Microsatellite data from the European Vitis Database were consulted to confirm identities (Bacilieri R. and This P. 2010: GrapeGen06 , an European project for the management and conservation of grapevine genetic resources - http://www1.montpellier.inra.fr/grapegen06/). To find matching profiles you need to adapt your allele sizes according to those of the four reference varieties given below or according to variety-profiles located in 'Microsatellites by varieties'. Genetic profiles of 3888 cultivars are available.